After the success of Chocolate-Nut Bark, I thought this no bake chocolate biscuit cake will be enjoyed just as well by my family. So I made a small batch of this cake. It was a breeze to prepare but had a tough time keeping my little one from checking on it :). We loved the cake just as it was. Later my husband and I were talking about how else to improvise and he said we could combine the chocolate-nut bark and this cake for a double-dhamaka. So my next project is to add chopped nuts to this cake for an extra crunch :). * Graham Crackers, Marie Biscuits, Digestive Biscuits are some other kinds of biscuits which can be used instead. Heat a big pot of water until it comes to a rolling boil. In a smaller pot, add chocolate chips, butter and milk. Place the smaller pot in the boiling water. Reduce the heat. Whisk until a sauce like consistency is achieved. Remove from the hot water. Let the sauce cool down for about 10-15 minutes. Meanwhile, break the biscuits into bit size pieces and set aside. When the chocolate sauce is sufficiently cool, add the biscuit pieces into it and gently mix until all the biscuit pieces are coated with the sauce. In a small loaf pan, line it with parchment paper/cling wrap, so that there is an over hang on all sides. Pour the chocolate mixture into the lined pan. Smooth the top with a spatula. Wrap the pan with the overhung parchment paper/cling wrap. Refrigerate it for about 3 hours allowing enough time for the cake to set. [I refrigerated for over 12 hours for practical reasons :) I made it late in the evening and so no natural light for the pictures :)]. When the cake is set well, Unwrap the parchment paper/cling wrap, and slice the cake to enjoy!! Check out the Blogging Marathon page for the other Blogging Marathoners doing this BM#73. Sending this to Srivalli's Kid's Delight - Chocolate Dishes hosted by Kalyani this month. 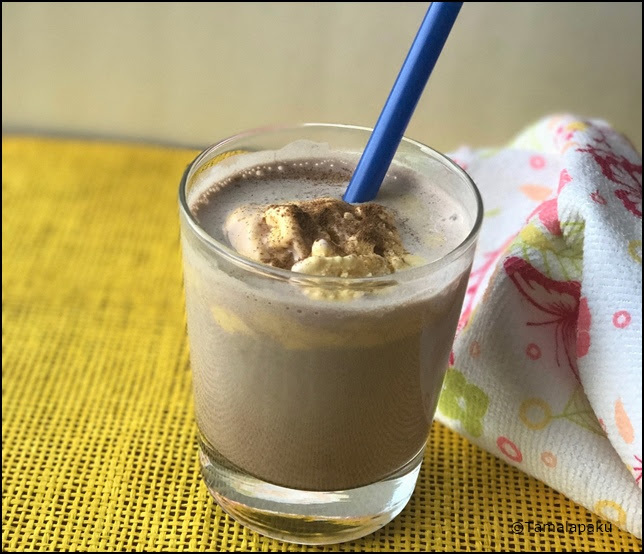 We just got a sneak peak of spring early this year and since the kids are all playing out, they came back for a snack break and this hot chocolate float was a delightful break for my little one. The quantities of the ingredients can be changed to fit the individual preferences. Boil milk , mix in the hot cocoa mix. Gently place the scoop out ice cream in the hot chocolate. Sprinkle cinnamon powder on top and serve immediately. I think it is compliment enough for me :). Make this and see the smiles in your loved one's faces. Melt the chocolate chips in your preferred method. I used a big pan of water, boiled it, put another small bowl of chocolate chips on top making sure that the boiling water doesn't mix with the chocolate. Whisk the chocolate until it melts. Mix in half of the chopped nuts. Prepare a baking tray with parchment paper. Pour the chocolate mixture on the parchment paper. Spread the mixture evenly. Let it set in the refrigerator for a couple of hours. Break it into manageable pieces and enjoy! For the last one in this series, I couldn't resist these muffins which are my little one's favorite ones. She prefers fruit in every meal and loves in her muffins, pancakes and waffles. So I have never to worry when there is a huge pile of kiwis in our fruit bowl! Preheat the oven to 375 °F. Line a muffin pan with liners. Blend the wet ingredients (sugar, oil, greek yogurt and water). Sieve the flour, baking powder, baking soda and salt in a mixing bowl. Slowly add the wet mixture into the flour and gently mix until combined. Fold in the chopped kiwi into the batter. Divide the batter equally into each of the muffin cups. I served it warm to my hungry kids as part of an after school snack! For the second sweet treat in this series, check out this mango flavored doodh peda which is a delight to have and can be whipped up in under 30 minutes. Make a smooth paste of ghee, milk powder and milk. Set aside. In a heated non stick pan, cook the mango puree until it thickens a little about 3-4 minutes. Add in the milk powder paste and cook the mixture while whisking it vigorously. Then add in the condensed milk and the coconut powder. After the mixture comes together as a single mass, transfer onto a greased plate and allow it to cool. When it is slightly warm, pinch small portion of the mixture with greased hands and roll into a smooth ball and press down a cashew to slightly flatten it. Continue to shape the rest of the mixture similarly. Serve as a dessert. Perfect for parties / religious events. This week, I shall present some quick and easy sweet treats to please one and all. I was talking to a friend about new ideas to make Indian sweets easier and quicker when she gave me a host of ideas, among which this 5 minute mysore pak topped my list. It so happened that I had to make this treat for a friend and so another favorite added to our list at home!! In a MW safe glass bowl, mix besan and a teaspoon of ghee and microwave for a minute until the raw smell goes away. Remove the roasted besan into a different bowl. In the glass bowl, melt the ghee for a minute so the ghee is hot. Add the remaining ingredients into the ghee, mix well so there are no lumps. Put it back into the MW and zap for a minute. Remove and mix well. Continue for another 3-4 times in 1 minute increments. [I totally cooked the mixture for 5 minutes but I could have stopped at 3 1/2 minutes for a lighter colored mysore pak]. When the mixture turns frothy and it becomes flaky and pores are visible, transfer the mixture into a greased plate. Allow it to cool for a couple of minutes and then with a sharp knife, make indents to slice as needed. After another 10 minutes, slice it and serve or store in an air tight container. For the last recipe for Holi this year, try this rose flavored semiya kheer which will please your senses and remind you of the upcoming spring season! Gulkhand is a sweet preserve of rose petals widely used in Ayurveda, for treating a wide range of ailments. It is very aromatic and stress buster as well. It is a coolant and reduces acidity and other digestion related problems. So the addition of gulkhand in semiya kheer makes it an exotic sweet dish which can be served on festive occasions. In a pan, boil the evaporated milk and the regular milk and add the semiya. Let the semiya cook for about 3-4 minutes. Add in crushed almonds and cashews, sugar, gulkhand and cardamom powder. Let the kheer boil for about 5 minutes. Remove from heat, garnish with roasted cashews and gulkhand and serve warm. The kheer can be chilled and served cold as well. For the second day, check out Malai kofta combined with Roti/Naan or Rice. Any festival is a time to indulge, right? So go ahead and indulge in this slightly guilt-free malai kofta to celebrate the festival of colors. *I have used a paniyaram pan /aabelskiver pan to make the koftas. An air fryer is also an excellent way to make these koftas. *But be careful if you plan on deep frying the koftas as they might crack open and splash hot oil. (Personal experience). Maybe try one kofta first to see if all is well. If there is a lot of moisture in the minced vegetables, it is advisable to squeeze out the excess water and use it. The water can be used to make the gravy. Mix all the ingredients needed to make koftas excluding corn flour/bread crumbs and oil and mix well. Add bread crumbs if using the paniyaram or the air fryer. Gently knead to make a stiff dough. Pinch small lime sized portions to make a kofta and cook them evenly in the paniyaram pan. If planning to deep fry the koftas, roll the koftas in cron flour and then gently slide into hot oil. Set aside the koftas while the gravy is prepared. I got about 20 koftas. In a heated pan, add oil, shajeera, cloves, cinnamon and cardamom. Saute the onions, ginger-garlic-green chili paste. Add in the tomatoes and cook until they turn mushy. Grind the mixture and pour it back into the pan. Add a little water to adjust the consistency. Sprinkle cashew powder, dhania powder, turmeric, jeera powder, red chili powder and salt. Let the mixture come to a rolling boil. Add cream/milk and let the mixture cook for a while. Remove from heat and add the koftas just before serving. Garnish with chopped coriander leaves. This week I have opted to showcase some recipes relevant to the festival of colors, Holi. Today's recipe, Thandai, is traditionally associated with the festival of Holi. It acts as a coolant and is served in summer. There are various versions of this beverage with rose water and melon seeds and some more exotic ingredients. But I loved the simplicity of these ingredients and tried it out at home. The kids felt the taste of saunf as the dominant flavor and asked me if I could reduce that flavor. Other than that, the beverage was rich, creamy and flavorful. PS - Don't skip the chilling time as the flavors need to blend in, rather soak in. But the straining part is optional. My personal preference is the smoother drink. Boil and cool the milk. Powder the ingredients listed under 'To Powder'. Blend the powder into the milk. I didn't separately powder the ingredients. 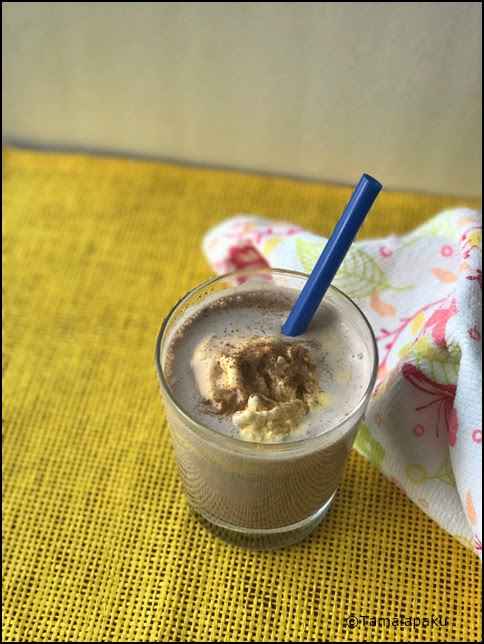 I used a high power blender (Vitamix) to directly blend the ingredients with milk. Strain the milk and mix in the powdered sugar and saffron. Serve with a garnish of crushed pistachios and crushed pepper.